Michael Brodie - The Virtual Boss- March 18, 2018, 10:52 a.m. If you are a company or an entrepreneur looking to hire virtual assistants, you must consider the virtual assistant fees you should pay to them. Note. When I say fees, I'm referring to salary. YOU DO NOT NEED TO PAY ANY MANAGEMENT FEES! if a company tries to charge you a monthly management fee, question it and ask yourself why you'd need to add another level of bureaucracy into the process? Remember, the aim of the game is to build a virtual team that is turnkey, a virtual assistant who will be working for you long term so that you don't become a firefighter, but instead you manage the business. You should focus on three important things in determining how much you will pay your virtual assistant. Note. 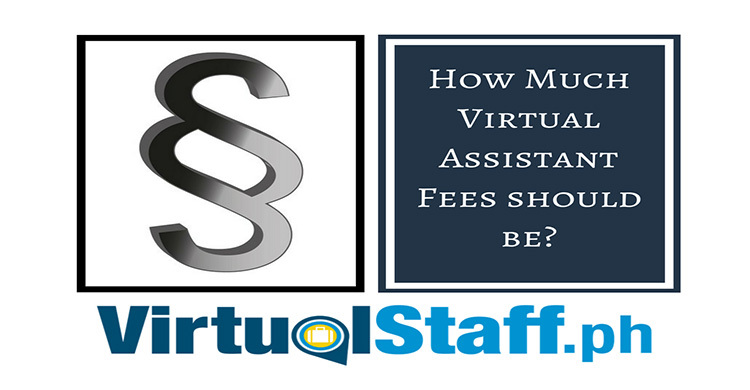 There is no hard and fast rule when it comes to deciding how much you are going to allocate for virtual assistant costs. The things listed below however are important considerations to take into account. There are virtual assistants who focus only on administrative tasks. There are also virtual assistants who have multiple skill sets and are therefore able to do more for their employers. Graphic designing is one of the technical skills that virtual assistants might have. This will be very helpful for your company especially if you'll assign tasks such as layout designing, crafting social media posts and creating simple logos. However, you should not expect your graphics virtual assistant to create full-scale graphics for your websites. If you want a full-scale graphics artist then hire a virtual employee in the Philippines who specializes in that area. Just like if you need a specialist programmer or SEO expert, then recruit based on those skills, just like you would back home. You can go to www.virtualstaff.ph where you can post jobs, find and hire virtual assistants and virtual employees. Another separate skill is that of content writing. This is considered a separate virtual assistant role since it might need a higher level of English language proficiency. Considering the skills you need your VA to have, the virtual assistant fees (salary) you should be in proportion to the specific skill being used by your virtual assistant. There are virtual assistants who have previously worked as a virtual assistant before. These virtual assistants usually charge a higher rate. Being able to have a good track record especially in the virtual assistance industry is important for these experienced VAs. Virtual assistants who are able to work for at least 1 year with one employer is considered a big advantage. I'll say this one more time, the aim of the game is to work with a virtual assistant long term. I assume you're in business for the long run? You can hire freelancers for temporary projects. Hiring a virtual assistant is for serious businesses that want to grow. You will definitely need to pay your VAs with previous work experiences with a higher rate. Hiring an experienced VA might actually be beneficial to you in the long run. You already know that the tasks you can outsource to virtual assistants are endless. Which brings us to another factor which is the specific job you are looking to outsource to your Virtual Assistant. Companies and entrepreneurs hiring virtual assistants have different needs. The specific jobs they are looking to outsource, plus the amount of work involved must be brought into consideration in determining virtual assistant fees/salary. If you are looking for a more experienced VA, then the rate you should offer must also be that of a more experienced person. Usually, this type of virtual assistant receive offers with a rate starting from $600-$800 and up per month, for full-time work. Part-time VA (virtual assistant) in this same position usually receives $300-$400 USD per month. As for the average salary of a Filipino virtual assistant? Their average rate is $400-$600 per month full-time. For part-time common VAs, their rate is $200-$300 per month. Note: You can also sometimes find VA's who can work for you on lower end tasks, such as data entry, from around $2-3/hour full. (Anything lower, then you usually run into problems, not always, but usually). It is also highly recommended that you pay your virtual assistant either weekly or twice per month, as opposed to monthly. At least initially, as the virtual worker is trusting you to pay them, so it offers some initial peace of mind for the first few months of working together. This will make your virtual assistant feel secure by having a feeling that this is a stable and long-term employment. Which as mentioned earlier, is the aim of the game here. This is not freelancing, it's about building a virtual team so that you can focus on the key areas of your business without worrying about the tasks you either hate doing or simply are not the best use of your time. If you're able to consider these important factors, you will surely be able to find good and highly-qualified VAs to work for you. Remember that as the employer, you expect good and high-quality results. As for your virtual assistants, they expect a salary that is competitive and sufficient for their needs. One final piece of advice to offer, repeating what I mentioned earlier, but I really do suggest you take a read of this. Hope this has helped, remember you can also contact me directly at www.michaelbrodie.net for more free outsourcing tips. The guy that's helped more businesses Outsource to the Philippines than anyone else on this planet!